with the onset of winter a hat is becoming mandatory to keep my ears and head warm. 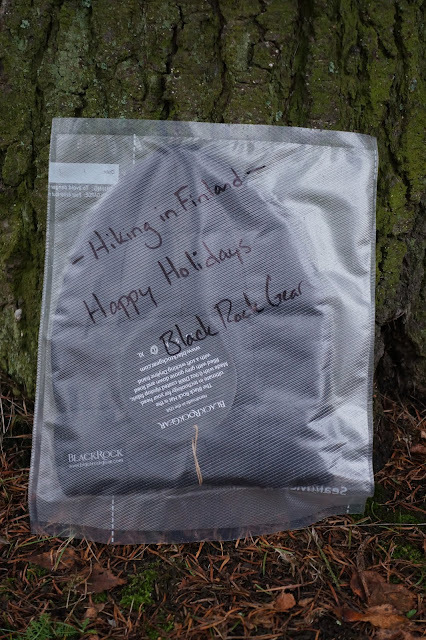 As you know by now, I diligently do my research, and found that the Black Rock Hat from Black Rock Gear is the warmest and lightest hat available for UL backpackers. That's because it is made of a DWR coated ripstop nylon and is filled with 900fp goose down, the lightest and warmest material around. It even has a soft inner headband, which feels great on the skin, and the snug fit means no heat can escape. I would wear it night and day, and make it part of my sleep system. And on trips where I won't need a hat during the day, its tiny packsize means it takes nearly no space in my pack but is there for me when I need it. I'm sure you'd like one as well, maybe ask Black Rock Gear if they make you one in Santa-Red? And did I mention that it is super-ultralight and warm already? Leave a comment with a mugshot photo in which you hold a piece of paper, stating a spectacular reason why you should win. Pixelmator and Photoshop Wizards, sorry, no editing text over a photo of yourself. You got till 18 o'clock Finnish time to make a mugshot photo and leave it in the comments underneath! Wow, you guys ROCK! I had the lolz looking through your awesome photos, some really hilarious ones there =) Many, many thanks, I wish I'd had some thirty plus hats to give away! And the winner is... Pontus Fagerudd - Congratulations! Please contact me via Email, you got till tomorrow 15 o'clock to get in touch otherwise it goes to the second in line! Thanks everyone else, see you tomorrow at 6 AM!